ORLANDO, FL — August 08, 2016 — Flip.to, the advocacy platform for hotels has attracted a massive audience of over 100,000 travelers for The Pines Resort in just the first year, while boosting the resort’s brand with compelling, co-created stories from their guests. 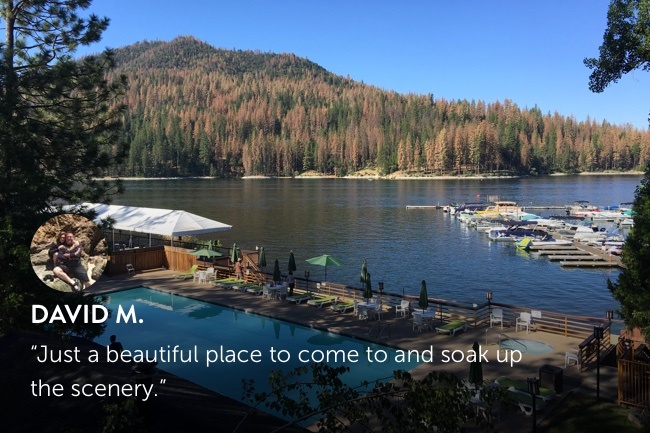 A mountain lodge nestled the Sierra National Forest near Yosemite National Park, The Pines Resort launched Flip.to in August of 2015. The property has seen enormous success, reaching this major milestone in less than 12 months. Flip.to has driven over 5,000 unique site visitors back to The Pines Resort’s hotel website, converting 450 warm leads and over 130 booked room nights for the hotel—and growing. Lauri R., past guest at The Pines Resort. The Flip.to platform has thoughtful touch points throughout the entire guest journey, bettering the conversation hotels have with guests from well before they stay until long after they leave. Flip.to lets guests share everything from their excitement for an upcoming trip to the favorite moment of their stay, tracking the entire conversion funnel down to how many travelers convert. The result is a huge driver of traffic and warm leads—potential guests who fall into a pool of like-minded travelers with similar interests and purchasing habits as the advocates for the hotel. The Pines’s Photo Explorer turns memorable guest moments into highly engaging interactions with every type of site visitor. “I’ve been amazed at the stories our guests capture, and it’s been even more exciting to see that when combined, they shape a candid story of our property,” emphasized Choe. 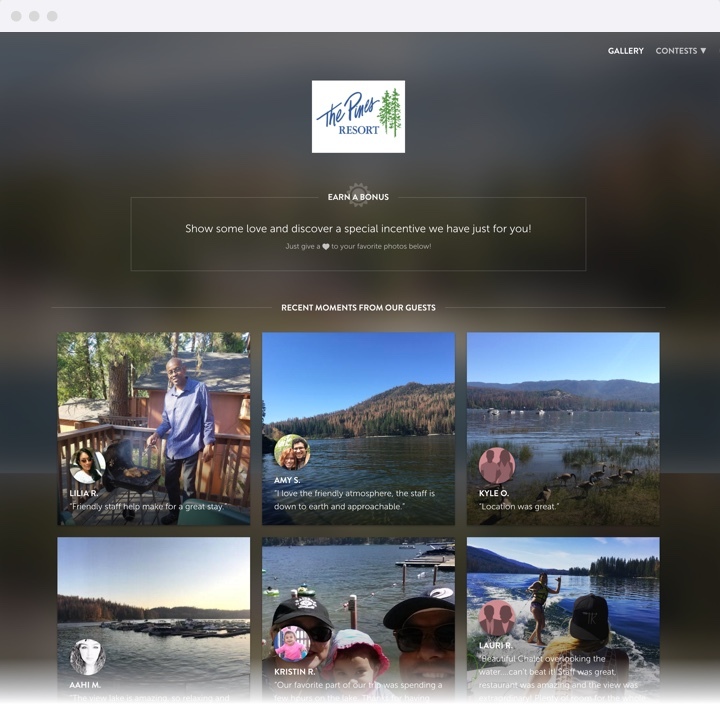 The Pines Resort inspires new audiences of travelers worldwide with Photo Explorer, a powerful digital experience by Flip.to that tells a rich story of the hotel through the compelling experiences shared by their guests. It showcases a library of authentic content that is an entirely new look at the hotel. Plus, with the recent launch of Vision AI—a new feature by Flip.to that uses artificial intelligence to let hotels better understand and curate content—hotels have insight on image attributes, colors and more, with the ability to filter and source content in seconds. David M., past guest at The Pines Resort. Tucked within towering pines alongside Bass Lake, the Pines Resort accommodations reflect a contemporary mountain décor inspired by the scenic, natural surroundings. Guests choose between 84 inviting mountain chalets, 20 deluxe lakefront suites or two private, fully-furnished houses that feature stunning forest or lakefront views and are within easy walking distance of the lake, the resort’s restaurants, recreational activities and retail shops. To reserve a stay, visit http://www.BassLake.com, or call 800-350-7463. Advocacy, hospitality, and big ideas converge, straight to your inbox. Rest assured, you can unsubscribe anytime. Keep an eye out for our email. Sorry, something went wrong on our side. Please try again in a few minutes, or let us know if you continue to have problems subscribing. Advocacy marketing platform builds momentum year round with help of their guests. Leading property management software, Resort Data Processing (RDP), and Flip.to, the advocacy marketing platform, are proud to announce a new partnership to help hotels, resorts, vacation rentals and travel brands worldwide grow booking potential and win more travelers. We teamed up with Fuel Travel and StayNTouch to learn from hoteliers and vendors about where the hospitality tech industry is heading. Advocacy platform pairs with Onsite Rental Management Association to foster education and partnerships in the diverse vacation rental market. Strategic partnership offers hoteliers ability to amplify booking potential and win more travelers.